*ARM PIT TO ARM PIT: Laid flat approx. 24"
*INSIDE POCKETS: 1 The bottom of the inside pocket is gone. It is completely torn open and you can put your whole hand between the inner liner and the outside shell. *INNER LINER: Standard Flat polyester inner liner. *FEATURES: Double collar, main zipper close cover, waist pocket covers, waist belt. 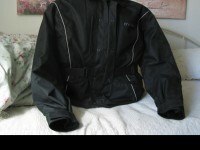 *CONDITION: Jacket has some minor knicks, dings, scratches and marks. 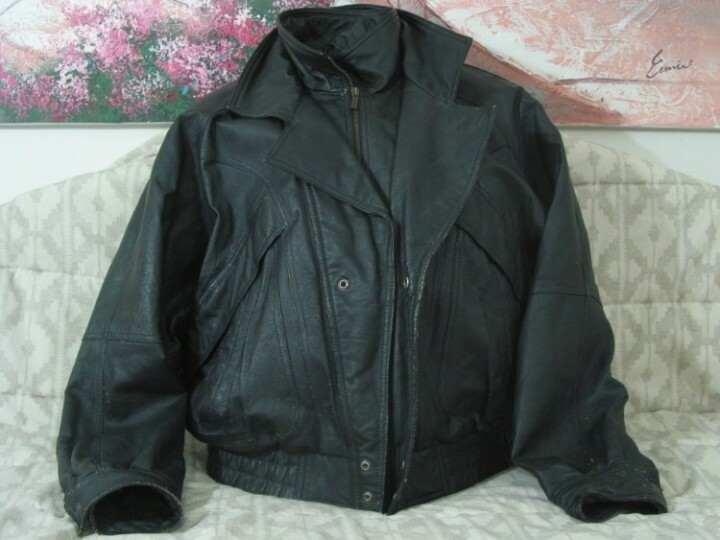 This jacket is clean and in decent shape. Jacket has some use wear but was well kept. There are some whitetish spots here and there especially on the cuffs. These whitetish spots are wear points and will need some leather black to cover them up. The shipping weight will be 5 1/2 lbs. A handling fee is charged to cover the time and any expenses associated with the packing and shipping of packages. Anything left is put towards the selling fee's.